Slightly on a tangent to my usual sort of post. but have decided to mix it up a bit and talk about my Michael Kors watches. Why? Because I love them. I always tend to feel a bit naked without a watch for some reason, and ever since I got the chunky gold one I’ve had a bit of a MK watch obsession. No doubt most will have seen the chunky gold one (the MK5055) before, it seems like it’s pretty much standard issue if you have a blog now (sadly not actually the case, this was actually an Xmas prezzie from the boyfriend a couple of years ago)! But I can totally understand why blog-land loves it though – I think it always makes an outfit more interesting just by slipping this watch on. It doesn’t really look that much smaller than the gold in these pictures, but it is and because it’s acrylic rather than metal it feels more delicate. In fact, the first time I wore it I kept checking that it hadn’t fallen off as I had been so use to wearing such a heavy watch before! MK 5400 – Looks massive, actually isn’t. Next up on my list is the tortoiseshell one, I was torn between this and the cream one when choosing before and now know I need it in my life. I can’t decide between the bigger and smaller size though. I was leaning towards the smaller but now thinking I prefer the chunky style!? Can’t decide! 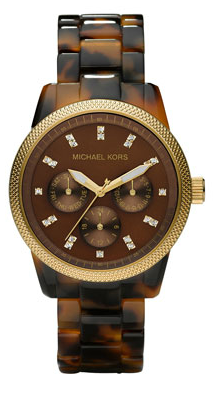 What do you think of the Michael Kors watches? I have the dark tortoiseshell watch, it looks great with every outfit. Do it. Ooh, I really really want to get it. Small one or chunky one though? !